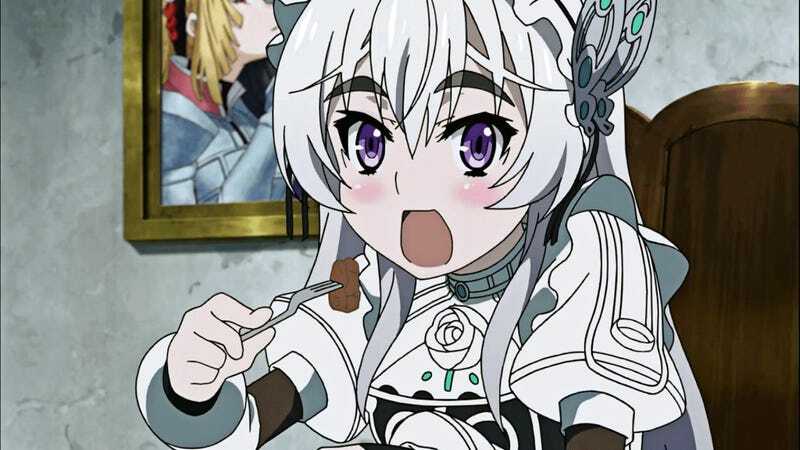 Major Spoilers for Hitsugi no Chaika seasons 1 and 2 follow - read at your own risk! If you spend any length of time in the otaku/anime community you will find yourself very familiar with word moe. It actually has kanji - (萌え) and comes from the verb moeru (萌える) meaning “to bud” or “to sprout,” as well as the homonym moeru (燃える) meaning “to burn.” It’s usually used to describe a passionate attachment (“burning” if you will) to female anime and manga characters who are adolescent (though it’s not restricted to this age group) and exude a sense of innocence, cuteness, or vulnerability. A prime example is Sailor Saturn - Hotaru Tomoe, whose last name uses the kanji for moe. As it’s a slang term and very “you know it when you see it,” many people outside of otaku culture actually don’t understand its usage, even if they get the feeling itself. For folks like my old-fashioned Japanese professor, I explain it as “the feeling you have when you see a puppy or kitten in a cast.” That seemed to work. SeanStan: To me, moe describes the burning sensation you get in your stomach when you have an impulsive desire to excitedly hug the cause of said sensation. Jonuiuc: Hmmm, when I think moe (and this is my made up definition, created simply out of seeing it used in contexts) I think mostly of art style. Big eyes, more “big head” proportions, softer lines, details. Raitzeno: for me, moe is the specific moment when a <whatever> dere first flips over to dere, both for that first instant ever toward that person, and when it finally happens permanently. One of the best examples of the phenomenon of “moe object” and what elements are used to make it work is in the recent anime and Ani-TAY favorite Hitsugi no Chaika (Chaika: the Coffin Princess). If you’ve read this far you’ve either seen it or ignored my warning and thus you know that the titular character, a young wizard named Chaika on a mission to collect her late father’s (and former evil emperor) remains, is only one of many “Chaikas.” The girl we follow for most of the series, “White Chaika,” is certainly a breakout moe character. She’s chock full of cute and endearing mannerisms: broken speech, a love of food (small girls who eat a lot is kind of a classic moe trait), and childlike innocence. Her actions not only endear her to her companions, Toru and Akari, but to the viewer. We share with the characters, especially Toru, a desire to protect Chaika and see her succeed. Not all of the Chaikas are moe, however, and it’s interesting to see how the show accomplishes this while still using the same basic figure, coloring, and features for all the girls. Red Chaika is the other obviously moe version. Her personality is tougher and feistier than White Chaika, but she retains the same soft facial features, speech mannerisms, and sense of not being too wise to the world. Her costume is more revealing than White Chaika, but it is still not overtly sexual. They both also share another trait that is often required for viewers to find something moe: a sense of ineptitude. No matter how capable a moe character is, they usually have some mental or physical trait that renders them vulnerable or unable to fully take care of themselves on their own. Many times this is accomplished by making the moe object a cute girl with fearsome powers but extreme physical frailty or illness, like Hotaru Tomoe or Rei Ayanami. In Chaika, both White and Red prove themselves in battle, but are physically small and show a general lack of knowledge about how the world works. They both require companions to take care of them, bail them out of trouble, and show them the ropes. The other Chaikas - Blue, Purple, and Black - are decidedly not moe. Moe is subjective to a degree, of course, but the character designers and writers did some clever things with these characters to make sure they don’t trigger that protective urge. As you can see in this handy picture board I threw together in MS Paint worked so hard on, the facial features of these Chaikas are sharper, both through eye shape and makeup, and don’t have much of that “moe blob” look. Their costumes are also sexier, almost like things a femme fatale would wear. Femme fatales and moe don’t really mix. These Chaikas also drop the cute mannerisms. They speak articulately and with deepy, more sultry voices than Red and White. They have the fighting or magic prowess of Red and White but not the innocence to make them into objects that must be protected. Blue and Black especially are portrayed as quite savvy and manipulative, willing to use and trick powerful men to achieve their goals. There is a little bit of meta commentary, whether intentional or not, within the show’s universe on moe. 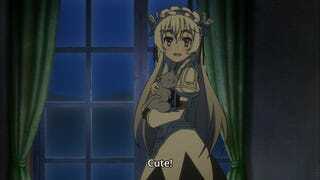 The male protagonist Toru is clearly taken with White Chaika. In the finale, he has a series of flashbacks while thinking about how much she means to him. All of the scenes he revisits are scenes of White Chaika actin in stereotypically moe fashion: eating, getting excited, doing her trademark show of gratitude, etc. Hitsugi no Chaika is a fun action and fantasy anime, but I believe the true pull of the show rests on the viewer’s reaction to Chaika as a moe object and empathizing with Toru’s perception of her as such. What makes a character moe won’t be exactly the same for any two viewers, but Chaika is a neatly packaged example of the most common toolkit anime creators use to spark that fuzzy, burning response. All of the Chaikas add up to a handy illustration about what can form the “skeleton” of a moe character: cute and soft looks, endearing mannerisms, and a degree of helplessness. It’s a set of characteristics that is hard to resist, and I personally loved White Chaika as a character, but it’s also worth turning a critical eye towards. Would we have found White or Red Chaika as endearing if she had spoken in full sentences or been completely independent? We should ask ourselves why these attributes need to be coupled with cuteness in female characters to make them desirable, or worthy of our empathy. It’s easy to get wrapped up in that moe feeling, but we should be aware that the insistence on “softening” strong personality traits like ambition, intelligence, or adaptability veers pretty close to the same messages real women and girls receive about what the “right” way to be feminine in the world is.